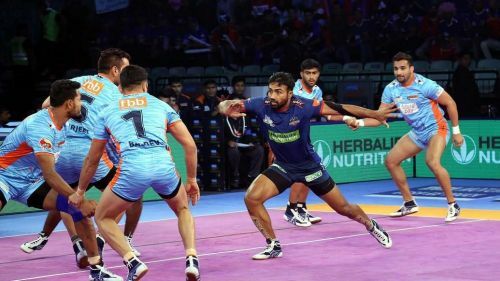 The Pro Kabaddi League 2018 saw the final action from the Delhi leg of the competition as the UP Yoddha took to the mat against the Haryana Steelers at the Thyagaraj Indoor Stadium as the inter-zone challenge week continued. Haryana Steelers came into this match on the back of a well-earned victory over the Bengal Warriors last night courtesy a strong performance by their skipper Monu Goyat. The star raider picked up a Super 10 and displayed great awareness to win the match in the final raid for the Steelers. The UP Yoddha are on a poor run of form for the past few weeks with no wins for their last nine matches. Injuries had plagued the UP Yoddha side with Rishank Devadiga and Prashant Rai missing out on action. They returned to action tonight and hoped to salvage some pride for the UP Yoddhas. Haryana Steelers virtually bowed out of the running for playoffs after losing out 30-29 against the UP Yoddha who had a strong second half tonight. The first half of the match saw the Haryana Steelers take control early in the match with the raiding duo of Monu Goyat and Vikas Khandola working well to keep the UP Yoddha defense on their toes. After trailing by seven points, the UP Yoddha defense pulled their socks up and got back in the match with a couple of good tackles and smart raids by Shrikant Jadhav. Sachin Kumar scored a two-point raid towards the end of the half to reduce the deficit further and the half ended with the Steelers leading 15-12. The second half saw the two sides keep it very close on the scoreboard as the raiders of both the teams kept scoring regularly. Monu Goyat reached his Super 10 in the second half and was clinical with his bonus attempts as well. Prashant Kumar Rai was the standout raider for the UP Yoddha side showing his strength to thwart away tackles from the Steelers' defence. It went down to the wire as a strong defence from the UP Yoddha in the second half saw them win it 30-29 in the end. The Haryana Steelers captain continued his momentum from last night as he scored six raid points in the first half with four bonus points. He was the key man for the Steelers as he reached another Super 10 this season and finished with eleven points. The leading scorer of the Haryana Steelers had a quiet outing compared to his usual standards as he finished with seven raid points which included two bonus points. The young all-rounder had another quiet outing for the Steelers as he managed to pick just one point in the first half. He had a better second half finishing the match with four touch points. The utility all-rounder had a poor night in the Haryana defence and after failing to pick any tackle point, was substituted at the end of the first half. The experienced cover defender scored just one tackle point in the first half of the match and was replaced by Sudhanshu Tyagi in the second half. Kuldeep Singh played as the left corner man for the Haryana Steelers and showed great composure to lock in ankle holds on the UP Yoddha raiders. He finished as the top defender on the mat for Haryana with three tackle points. The young right corner Sunil was wasteful with his tackle attempts giving away easy points to the UP raiders. He did not manage any tackle point tonight for the Steelers. The young defender came off the bench to replace Mayur Shivtarkar in the cover position but did not manage a tackle point. The burly defender replaced Sachin Shingade in the defensive setup of the Haryana Steelers in the second half. He picked up one tackle point with a strong block.